(Phys.org) -- Researchers in Australia have discovered that mourning cuttlefish (Sepia plangon) have the unique property of being able to change the coloring on one side of their body to mimic the coloring of a female to fool rivals, while displaying typically male coloring on the side that a nearby female sees; all at the same time. The team, led by Culum Brown at Macquarie University first noticed the sly behavior in a large test tank. Subsequent research showed that the ploy was prevalent in the wild as well. The team has had their paper describing their findings published in the journal Biology Letters. Mourning cuttlefish are not actually fish, they are more closely related to squid and octopus, and like them they can not only shoot ink into the water to make a hasty escape from predators, but can change the coloring of their skin at will. Up until now, researchers had assumed the coloring changes were used only to help the cuttlefish hide from predators passing by. After witnessing one specimen change his coloring on just one side of his body to mask his presence from a rival male while simultaneously displaying different coloring on the other, the team looked a little deeper, studying pictures and video of the cuttlefish taken over time of cuttlefish that lived in Sydney Harbor and discovered something that had been missed before; males displaying split-down-the-middle coloring when trying to mate with a female while at the same time, hiding that fact from other males in the area. This video shows tactical deception employed in the mesocosm. Rival males are to the right of screen. This research was published in the journal Biology Letters in the paper: It pays to cheat: tactical deception in a cephalopod social signalling system by Culum Brown, Martin P. Garwood and Jane E. Williamson. It doesnt work every time of course as sometimes the rivals catch on, which generally results in a fight; something cuttlefish want to avoid because sometimes another rival can sneak in while two others are otherwise engaged and make the whole bout moot. The researchers say the deceptive ploy by the male cuttlefish is yet another instance of intelligence and that the males are smart enough to employ the technique only when it has a fair chance of working. Thus, if more than two males (or multiple females) are around, they dont even bother. 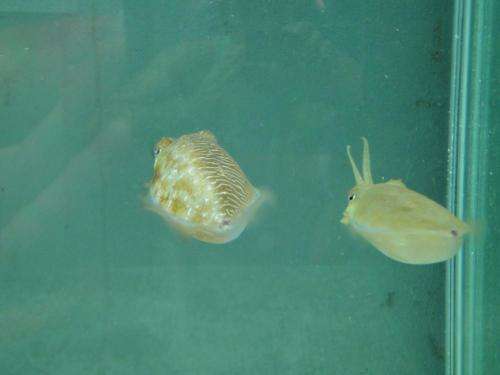 The fact that the behavior is so directed indicates the cuttlefish are aware of what they are doing, which shows that some sort of thinking is going on. Being cephalopods, cuttlefish are members of one the smartest groups of creatures that live under the sea, with bigger brains relative to body size than any other invertebrate. Theyre also very social. Some have been seen to bond with schools of fish when separated from their own kind. How can a colorblind animal change its colors to blend into the background?